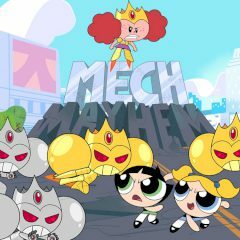 Get ready to protect Powerpuff girls from the nasty robots. Strike them exactly at that time, when they are going to attack you. Make combos and increase your points. Time to time Powerpuff girls need to show their strength and ability to protect themselves from various scums. This time they were offended in school and were called tiny. This is so embarrassing and they won't take as granted. Deal with your insulter after the school and show everything you know.